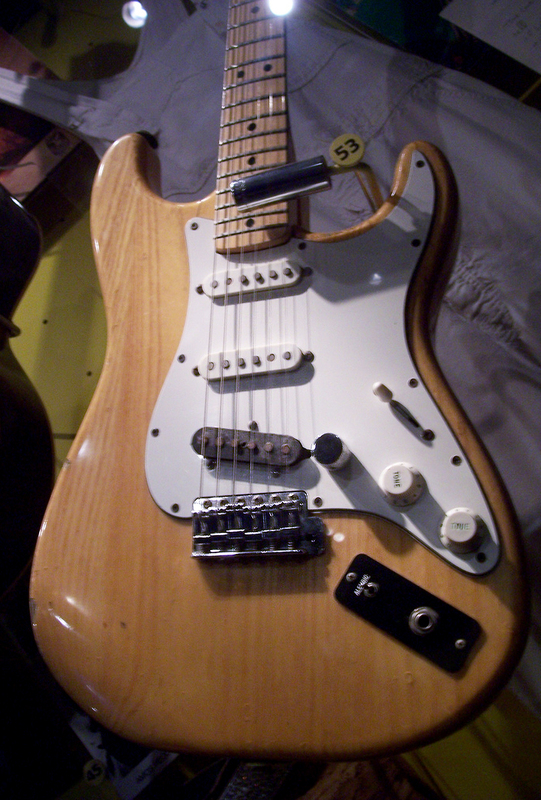 Lowell George from Little Feat’s 1970’s Fender Stratocaster. This is one his last ones, apparently he got so many guitars stolen during his career that he only played on modern Strats that was easy and cheap to replace. Most of them did look the same since he favoured light wood coloured big headed Strats with maple necks. He always installed a Telecaster bridge pickup and volume knob and used an 11/16 socket wrench as a slide. Don’t ask me what’s going on with the input jack but he changed that on all his guitars too. Notice his dungarees behind the guitar. Lowell George struggled quite a lot in life and was addicted to cocaine and hamburgers but he was a helluva slide player. Little Feat, the best kept secret of the Seventies. Lowell installed Alembic Stratoblaster preamps (http://alembic.stores.yahoo.net/blaster.html) on his strats. These do not require any guitar mods and buffer the pickups so there is no treble loss. This is one way he was able to get that airy, silky top-end for slide work (of course, his technique was the most important ingredient). Stratoblasters were fairly common in the ’70s, disappeared for a while, but are available again.